Well the quilt went down a treat - thank goodness! The housewarming was a lovely, fun night. Bec put on a great spread of gluten free food - all yummy stuff - and we all had a wonderful time, catching up with family and celebrating the move into her own new home - always a huge step for anyone. And she loved the quilt. There's something undescribably pleasing about making something for someone who utterly appreciates the work and love that goes into it, and that makes it all worthwhile. In fact, I got a few "ooooh, I'd love one too" comments - so who knows, I might be able to improve if I do a few more - but I think I'll have a break for a while and get back into my one true love - stitching (or at least until I find a good professional quilter).. 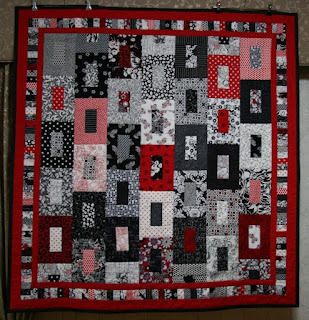 I do love quilts. I love their amazing colour schemes. I love the huge assortment of designs. I love the feel of them. There's something so comforting about them. I love cutting out all the pieces. I love stitching the pieces together. I love seeing them come to life. But I hate quilting them!!!!! I know there must be a method to cramming a huge amount of fabric through the small hole on my sewing machine - but I've yet to discover what that is. And so, my nieces quilt is finally complete. I think I'm happy with it. There's always that nagging in the back of my mind, that I could've done it better - possibly taking it to a professional quilter could have erased these nagging thoughts, but ... there's always next time. I had tossed up with the idea of sending it to be professionally quilted - I really like the look of the all-over quilting - but time was against me. The house-warming is tomorrow night. I only hope she likes it and that she knows wherever she goes in life, or whatever she does, whatever happens, and no matter how old she'll be, she'll always be able to wrap my love around her for comfort. I know I've been a bit quiet lately - not a lots been happening on the crafty side of life, but life's been anything but dull. I celebrated a milestone birthday and was spoilt, which is always lovely, and was given a holiday to Singapore as a gift. So all this excitement and travel has kept me away from creativity. Another reason I've been quite is because I was waiting until I found out ....... that I passed my City and Guilds, Embroidery Level 3 ... Yayyyy!!!!!! Just waiting for the certificate now, but what a huge relief. I finished it all in April, and thought that I'd like a break from it for a while, but to be honest, I've really missed the structure of it, and the need to push myself to keep learning and researching, and this week I finally got my mojo back and feel creative again. So I've started a lap quilt. I absolutely adore quilts, but its not one of my finest talents - my brain just can't work around the mathematical side of it all. I'm alright if I'm following a pattern, but this time I bought a jelly roll and decided to "wing" it and create something of my own. In time this might turn out to be a mistake - but we'll see what its like when its finished. All was going well, until ...... oops! Must've been tired when I pinned and stitched that block together ... but never mind, soon fixed. It's still a work in progress, so stay tuned for the finished result. As always I have my wee girl Bonnie by my side, who always likes to help, especially by sitting on the blocks when they're spread on the floor. But she's feeling the cold weather a bit lately and decided it was more fun to curl up in mummy's dressing gown and sleep all day. It's a dogs life!! On a completely different note, I wanted to share this with you - I was watching re-runs of Heartbeat the other night and noticed a blooper on the credits. Can you spot it? 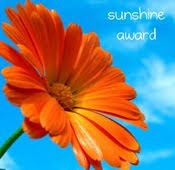 And before I go, many thanks to Sharon for awarding me another Leibster award, its always very gratifying to know people appreciate my blog and enjoy reading it. And thank you to Virginia for your kind comments about finishing my course - unfortunately you have a "no rely" and I can't reply directly to you.